DEERFIELD, ILL. - Caterpillar Inc. (NYSE: CAT) today announced that SunPower (NASDAQ: SPWR) now provides high-efficiency SunPower® Performance Series (P-Series) solar panels under the Cat® brand. Offered as part of the Cat Hybrid Energy Solutions suite, the monocrystalline, shingled-cell Cat PVC395 MP solar panels are currently available through the Cat dealer network in Southeast Asia, Africa, South America, and the Middle East. Providing efficiency, performance and dependability, Cat PVC395 MP solar panels are rated at 395 watts per panel and achieve efficiencies of over 19 percent through an innovative shingled-cell design with multiple redundant paths for electricity flow. 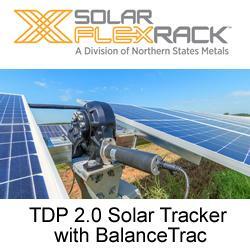 This eliminates many of the reliability challenges of traditional front-contact solar panels. Additionally, the panels use a unique parallel circuit architecture that significantly limits power loss from shade and soiling. "Backed by SunPowers product and power warranty, the P-Series solar panel technology offered through our relationship with Caterpillar can generate up to 32 percent more energy than conventional panels in the same space over 25 years," said Peter Aschenbrenner, executive vice president for SunPower. "Our technology is the most sold shingled-cell solar panel in the world, maximizing production and delivering long-term value. Were pleased to collaborate with Caterpillar, an exceptional brand with a strong commitment to sustainability." Cat PVC395 MP solar panels are the latest addition to the Cat Hybrid Energy Solutions suite, an innovative lineup of power systems that combines environmentally friendly solar panels, state-of-the-art energy conversion and storage technologies, and advanced monitoring and control systems with Caterpillars traditional line of reliable power generation equipment. "SunPower shares Caterpillars commitment to developing an impressive portfolio of technologies with proven durability and performance in the field," said Joel Feucht, general manager in Caterpillars Global Power Solutions Division. "By expanding our global solar offering, the world-class Cat dealer network can better serve the growing customer demand for cost-effective solar energy, backed by the reliable power of Cat standby- or prime-rated generator sets." •	Cat Bi-Directional Power (BDP) inverters, which provide real and reactive power with grid-forming and grid-following capabilities. For more information, visit www.cat.com/microgrid or e-mail cat_power@cat.com. To interact with other power generation professionals in our online community, register at http://forums.cat.com/powerperspectives. As one of the world's most innovative and sustainable energy companies, SunPower Corporation (NASDAQ: SPWR) provides a diverse group of customers with complete solar solutions and services. Residential customers, businesses, governments, schools and utilities around the globe rely on SunPowers more than 30 years of proven experience. From the first flip of the switch, SunPower delivers maximum value and superb performance throughout the long life of every solar system. Headquartered in Silicon Valley, SunPower has dedicated, customer-focused employees in Africa, Asia, Australia, Europe, North and South America. For more information about how SunPower is changing the way our world is powered, visit www.sunpower.com. For more than 90 years, Caterpillar Inc. has been making sustainable progress possible and driving positive change on every continent. Customers turn to Caterpillar to help them develop infrastructure, energy and natural resource assets. With 2017 sales and revenues of $45.462 billion, Caterpillar is the worlds leading manufacturer of construction and mining equipment, diesel and natural gas engines, industrial gas turbines and diesel-electric locomotives. The company principally operates through its three primary segments - Construction Industries, Resource Industries and Energy & Transportation - and also provides financing and related services through its Financial Products segment. For more information, visit caterpillar.com. To connect with us on social media, visit caterpillar.com/social-media. CAT, CATERPILLAR, their respective logos, "Caterpillar Yellow," the "Power Edge" trade dress as well as corporate and product identity used herein, are trademarks of Caterpillar and may not be used without permission. SUNPOWER and the SUNPOWER logo are registered trademarks of SunPower Corporation in the U.S. and other countries as well.